Magnetic mould clamping system（MMCS）is a kind of new style mould change system which opens or closes magnetic force by electric pulse. utilize different character of various permanent magnetic material to design the best magnetic path, control and switch the distribution of inter magnetic path via electric controlling system. Make its own system balance of the permanent magnetic field. 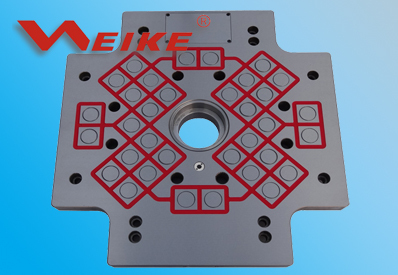 Due to the clamping force distributes contact surface evenly, the integration of mould/magnetic plate/machine back plate is a perfect combination and guarantee outstanding performance. MMCS is mainly for the solution to traditional injection molding machine, punch, closing device. The old method of clamping mould costs long time, operate complexity, low safety. This system utilizes electro permanent magnetic mould and dynamic mould, do simple magnetization/demagnetization operation, change the mould within 3 minutes, it can be equipped in new unit as standard parts, or improve the machines which is being used, save the cost of investment. 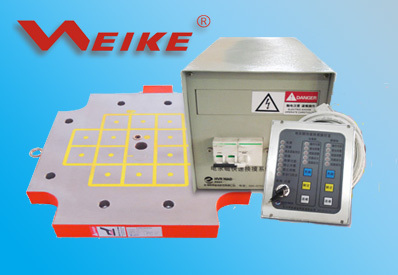 1 Reliable safety protection, warning function of overcurrent/undercurrent. 3 Wide applicability, allow to design the shape and size based on different requirements. 4 Easy to install, won’t change the appearance of equipment.